With winter finally vanquished here in the USA (or, most of the USA, anyway! ), our long-awaited migratory birds have returned and are busy fattening up and building nests. Many standard bird feeders, foods and other supplies work well year round, but spring also brings some changes that provide new opportunities for us to assist our avian friends. As competition for food (especially insects), water and nest sites increases, small, retiring birds may be forced away from backyard bird feeders, baths and houses. This is especially true in areas where Starlings, English Sparrows and other aggressive species are common. Warblers, Vireos, Wrens and similar native birds are at a disadvantage, and many are in decline. Bats are also in trouble, with many suffering from an emerging disease, habitat loss and insecticide use…a bat house can be a real boon to local populations. Following are a few interesting items that can be used to lend a hand. Although common birds can co-opt houses designed for rare ones, trying to cater to the needs of individual species can prove effective. This is especially true if you place nest boxes in locations that will draw target species and discourage others. Please post below if you have questions on nest box placement. I especially like the Gourd House. Although designed with Purple Martins in mind, this unique little nest site should also prove attractive to various wrens and finches. It is constructed of plastic and equipped with a drain hole. A ring allows you to easily hang it in the thick cover favored by many small, shy birds. 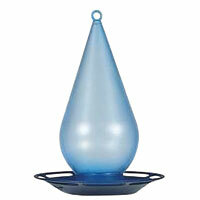 Also available are houses with dimensions that will suit Chickadees, Blue Birds and similar species. 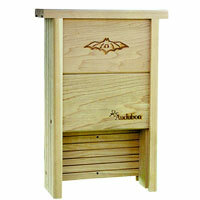 The Audubon/Woodlink Bat House is very sturdy, and quite attractive. Even if you do not regularly see bats, it may be worth a try. Little Brown Bats and several other species have managed to hang on even in the heart of NYC, and safe roosting sites are critical to their well-being. Given that even the smallest bats can consume at least 600 insects per hour – many of which will likely be mosquitoes – bat roosts aren’t bad for our well-being either! I found two interesting items which should appeal to birds that are reluctant to leave cover in order to drink and bathe. The Perky Pet Droplet Station is a source of drinking water rather than a bird bath (water is enclosed…so no cleaning needed!). It is small and easy to hang amid vines and branches. The terra cotta Glazed Bird Bath can also be hung in locations that may dissuade starlings and other backyard “bullies” while attracting warblers, native sparrows, thrushes, and similar birds. Most typical backyard birds consume protein-rich foods as the breeding season approaches, and rear their chicks on insects and other invertebrates. While the spring spike in insect populations is usually sufficient, there may be situations where supplementary feeding will benefit small birds. Freeze-dried mealworms might be just the thing to convince Brown Thrashers, various warblers, and other secretive insectivores to visit your feeders. It may also be useful to provide species-specific foods and feeders that are designed with finches, hummingbirds and others in mind. Seed mixes that contain ingredients favored by Goldfinches, Cardinals and others are now available. Chuckanut’s Backyard Wildlife Diet will attract chipmunks, squirrels, rabbits, and other native mammals. If you’re lucky, and able to view your feeders after dark, you may even get to see my all-time favorites, Flying Squirrels. Previous: My Parrot is Sneezing – What’s Wrong! ?